GoBetGo is a Bitcoin online gambling site that combines the betting services offered by a casino, a sportsbook, and a lottery site. It is relatively young, having been launched in the first month of 2014, but is already licensed to operate worldwide. Although US-based players are generally prohibited to wager on this casino, they can still enjoy the gambling services it offers, provided that they use the virtual currency as their primary method of payment. 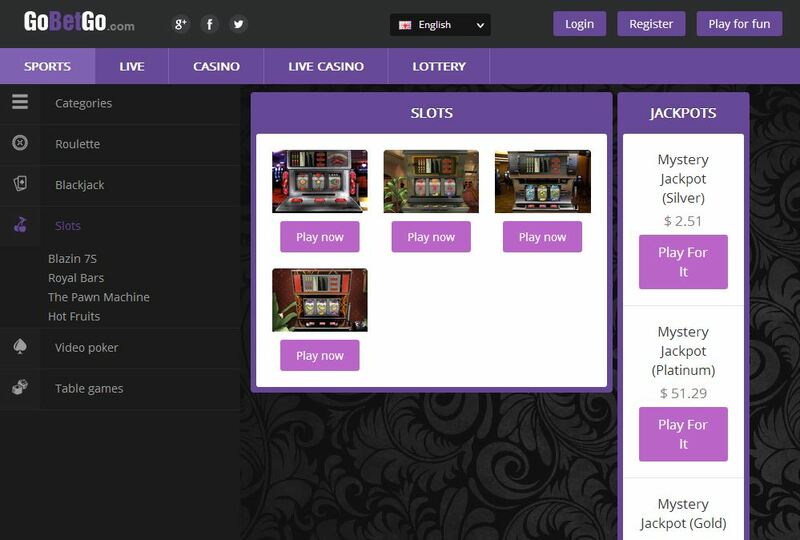 This gambling site, despite being new, has already shown a great potential in succeeding in the industry. In fact, it would not be surprising if this online gambling business becomes one of the newest favorites of avid Bitcoin bettors, especially now that casino betting has become one of the most in-demand activities online. With that being said, GoBetGo has equipped its casino library with an extensive catalog of Bitcoin games, including slots. While the classic games of roulette, blackjack, video poker, baccarat, and an array of table games populate the game library, not many Bitcoin slot games can be found here, which affects the ability of this Bitcoin casino to provide first-class online slots betting. Unfortunately, Ultraplay, the casino software this online casino uses, has not produced many slot games. Apart from the shortage of Bitcoin slots here, only the classic three-reel slots are available. Although there is nothing bad about these slot games, which successfully resemble the old-fashioned slot machines in land-based casinos, majority of the Bitcoin casino bettors nowadays prefers to wager on the graphic-intense and feature-packed five-reel video slots. Nevertheless, slots enthusiasts, especially those who fancy the classic three-reel slots, will surely enjoy playing Blazin 7s, Royal Bars, The Pawn Machine, and Hot Fruits. After all, besides the fact that they succeed in reviving the vintage slot machines, they are also able to provide players with the opportunity to enjoy spinning the reels as many times as they want and be rewarded with huge payouts. Moreover, each Bitcoin slot game enables bettors to choose the limits that are perfect for their bankroll. For instance, players can choose to play Bitcoin slots with low limits if they are hesitant to wager more than 0.30 coins. Meanwhile, playing with standard limits pose higher minimum and maximum bets that translate to higher payouts. If slot bettors intend to win big, however, then they can choose to be a high roller and bet at least 5 coins or play one round with 15 coins. GoBetGo may lack the in-demand Bitcoin slot games, but it still manages to create an exciting and rewarding casino gambling experience for avid online players through its attractive promotions and seamless banking methods. Therefore, those who have no qualms about playing the classic three-reel slots here and are eager to experience the wonders this Bitcoin casino can offer should simply head over to GoBetGo and wager now.